What is a vanity website for if not to have pages about the family dog? Patty was adopted from the Riverside Humane Society on February 14, 2003. She had an excellent week with trainer Aileen Staylon. Now, more than two years later, her wonderful training has fallen by the wayside, through no fault of hers and every fault of the people she lives with. Tímea had been asking for a dog for a long time. We have been trying to appease her with easier to care for pets. First some goldfish and more recently a parakeet. But Tímea correctly feels that she can't really engage with those pets. So instead of getting a whole menagerie of compromises and then the dog, we thought we would get a dog while we were just some goldfish and a parakeet behind. What really tipped the balance, however, is when she asked for a baby sister. She arrived at the Humane Society with no name. They called her "Bridget", while "Patty" is the name of our choosing. (It is like "Patience" without being "Patience".) Anyway here is how the Humane Society described our Patty. Bridget - I'm a female Terrier mix, about 3 years old. I have a sweet and friendly disposition and am very playful. I would probably be fine around school aged children. I need to be an indoor pet as I'm too small and sensitive to do well outside. 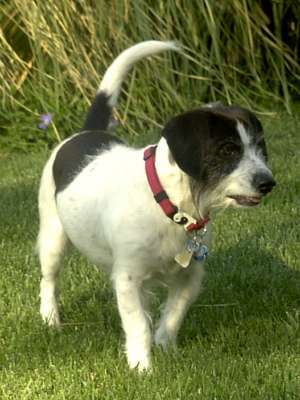 Terriers are not known to shed or have dog dander which makes them a great choice as an indoor dog. The only history we have of her was that she'd been rescued from Banning (CA) dog pound by the Humane Society. She'd already been spayed. And showed every sign of having been an indoor pet who was well cared for (except for her teeth). Once we got her gum inflammation under control, she became much more lively. She is extremely attached to us, and she is a jealous dog that will have no other dogs before her. She is extremely affectionate and remarkably patient with small children. But as her training wore off, she is not all that well socialized with other dogs. And she barks incessantly at unknown adults when we are around. She is absolutely a perfect dog for the whole family. She loves going for walks and we love taking here. She accompanies Tímea and Jeff on Tímea's walk to school each day. Lívia will take her for an evening walk, and will frequently will take her for a late morning walk. Lívia initially could not really conceive of a dog living in the house with the family. Now Lívia is probably the most attached to her. She sleeps in Tímea's bed at night, and just about every other place during the day. She tries to find a strategic location where she can monitor all movement in the house. Patty feels that it is her job to keep the pack together, particularly when we are away from home. When we are away from home with Patty and one of us goes into, say, a grocery store, Patty will make it very clear to the others that we must follow the departing person before we lose their scent. She will whine and pull, absolutely bewildered and annoyed that we don't seem to share her sense of urgency. Despite these frustrations, she seems to love us anyway. Despite the obvious affection, we do have some suspicions. She is appearently trying to kill us. Her cunning plan is to sleep in the dark at the top of the stairs. We still don't know for certain why she is trying to kill us, it might have something to do rules about begging from the table, but since these rules are only erradically enforced, it might be something else. Probably it is because when we leave the house, we don't always take her with us. We may wish to consult with a doggy psychologist, but we're not at all certain that exploring Patty's relationship with her own mother will really be that helpful. Since we moved from Riverside, California to Plano, Texas in summer 2005, Patty has adjusted remarkably well. But she still hasn't gotten used to the local wildlife. Back in Riverside, the rabbits were larger, had stubbier tails and ran into bushes and burrows when chased. Here the Plano rabbits have much bushier tails, very small ears, and run up trees when they are chased. Patty has developed what may turn out to be an effective way of catching them. She chases them up a tree, and then she continues to bark and jump at the foot of the tree. Meanwhile the rabbit will have long since scampered to another tree. Patty, however, will continue for some length of time barking up the wrong tree. We suspect that her plan is to do this so long that the Plano rabbits will fall out of the tree from laughter. She has yet to succeed at this, but her efforts look promising. Recently she has added an additional strategy. These Plano rabbits (unlike the Riverside ones) tend to eat acorns instead of grass. Patty must have noticed this and suspected that this gave them their tree climbing powers. So Patty now is eating acorns.